We offer a free on site estimating service.Simply ring or email and we will promptly arrange to pay a visit to your home to discuss your requirements, for example how many switches, light fittings & sockets that you may require in each room so that we can provide you with an accurate written estimate for the work. We offer a new consumer unit replacement service to replace your old fuseboard. This can only be done if your existing wiring is not in a perished condition. A new consumer unit will make your installation that much safer and includes the very latest miniature circuits breakers for each circuit. These replace the old fuse wires & RCDs to provide earth fault protection making it much safer when using hand held portable equipment such as Lawn mowers etc. Prices start from only £250 for a 4 to 6 way fuseboard. 6 to 8 way from only £350 fully fitted. 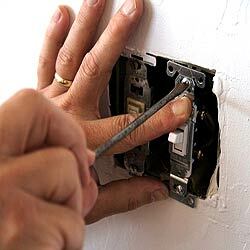 At A1 Electrical we pride ourselves on our quality of workmanship and after sales service. Your house rewire will be carried out to the very highest standards by our fully trained and friendly staff, we have carried out 1000's of rewires all over Merseyside, Southport, Wirral, Chester, Warrington and Ormskirk. All equipment, sockets and switches etc will be of first class quality and are covered by a ten year manufacturers guarantee. All cables installed are BASEC approved. Your fuse board will be the very latest type with appropriate miniature circuit breakers for each circuit (these replace the old fuse wires) no need to mend any more fuses, and an RCD residual circuit device will be fitted as standard to provide earth fault protection to all circuits, making it much safer when using hand held portable equipment such as lawn mowers etc. The majority of rewires that we do are occupied properties and our friendly and experienced staff are keen to carry out the work with the minimum of disturbance, We will move any furniture necessary during the course of the work. Any carpets that need to be lifted to gain access will be removed and refitted by us. All our staff are supplied with industrial vacuum cleaners and working dust sheets to enable the work to be carried out to the highest standard. Any damaged plasterwork will be made good, however, we do try our best where possible not to damage plasterwork by using existing metal conduits or capping, or by running cables in partition walls, this is only possible if conduits or capping were installed when the property was built, we can then pull the new cables through whilst pulling the old cables out and therefore minimizing damage to decor. A1 Electrical Ensures the neatest possible installation, for example, in order to bury cables into the wall where there are no conduits to feed the cables through, the majority of contractors completely damage your wall paper leaving you with no alternative but to redecorate at additional cost to you, not with our unique rewiring method, providing your walls have only one layer of paper we can usually cut a neat strip of wall paper and re paste back once the cables have been installed. Please note this is not possible with all types of wallpaper but it is achievable and very successful on the majority of house rewires that we carry out. All our work is guaranteed and an NICEIC Certificate is issued with each installation, together with a Part P Building Regulations document to comply with the latest government legislation. A1 Electrical is fully insured and has two million pounds Public Liability Cover. Q. Will my fridge or freezer be affected during rewiring? A. No. We will ensure that your fridge & freezer is kept working at all times. The same applies to your TV and other appliances including central heating boiler. Q. Will I be without power for the duration of the work? A. No. We carry out all rewires rewiring a circuit at a time, and reinstate the power as the work is in progress with minimum disturbance to your daily routine.